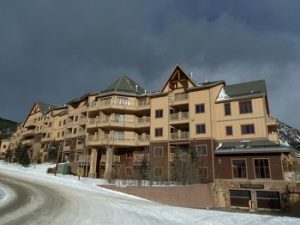 Red Hawk Lodge Condo is located in River Run in Keystone CO Real Estate. Steps from the Keystone Gondola, the shopping, dining and activities in River Run make for an ideal location for owners and guests. This River Run condo complex was built in 1999 with 100 units comprised of 2 – studios, 42 – one bedrooms, 49 – two bedrooms, 5 – three bedrooms and 2 – four bedrooms. Red Hawk Lodge Condo is one of the largest condo complexes in River Run. Views vary from the decks of these River Run condos of either the ski slopes, down valley of the wetlands and Snake River or the surrounding mountains. Red Hawk Lodge Condo has a wide array of amenities including an outdoor heated pool, outdoor hot tubs, fitness room, steam room, underground heated parking with bike storage, ski lockers, lobby with rock fireplace, wet bar and pool table, sauna and outdoor grills. This private River Run condo complex is great if you enjoy being close to the action but want a more quiet building in Keystone CO Real Estate. For information about Red Hawk Lodge Condos currently listed, previous sales and other condos for sale in Keystone CO Real Estate contact Justin and Krystal Knott with LIV Sotheby’s International Realty. We are happy to answer all your Summit County Real Estate questions.